Our state-of-the-art facilities are located strategically worldwide to provide our customers with improved accessibility in order to minimize cost and carbon footprint. 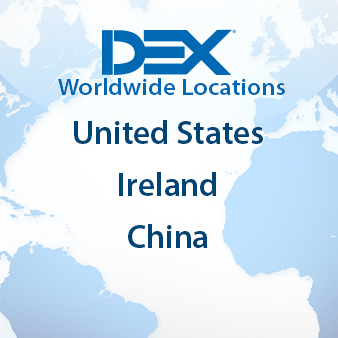 DEX offers complete product design, technology and end-to-end, integrated manufacturing services. We are committed to providing an extensive range of design and engineering services that complement our manufacturing solutions strategy. Our capabilities allow you to customize each order to your exact specifications and minimize internal resource allocation. Extend the life cycle of your products by replacing worn out or obsolete components and modules. Maximize the life of your assets and control costs without sacrificing quality or impacting uptime. Management of all aspects of the supply chain logistics and restocking processes essential to the efficient operation. Lower your overall return center costs & decrease storage, labor and freight with increased speed, visibility, and control into your operations. DEX streamlines and cleans up your supply chain by applying lean tools and processes. Take advantage of our global warehouse facilities' stock of parts and our immense network of OEMs and other manufacturers. DEX also offers revenue sharing programs for your overstock parts as additional incentive for partnerships. Our parts exchange program functions as a core return, meaning that DEX will buy or credit its customers for the value of parts returned to us. 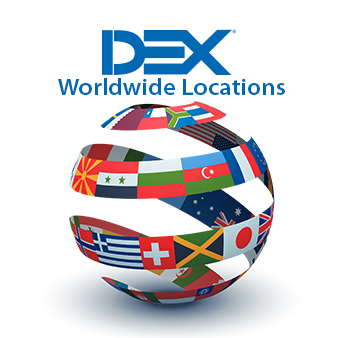 Hundreds of customers wourldwide use DEX repair services. Meet our customers. The DEX Solution can support all of our business models. It works as any other module within Oracle, its plug and play and very easy to use. Our sales rep. has worked miracles for us in some of our requests we have brought to him. It has been a pleasure and I have recommended DEX to our service team to throw more their/your way. Great overall relationship. Queries are always responded to swiftly and effectively Keep up the good work. DEX is my preferred supplier for this account. This is based on the excellent account management and support received. We are kept up to date on part status from the moment a PO drops to shipment. DEX have proven to be an invaluable partner and I look forward to continuing this relationship. I know if a part is coming from DEX it will meet my requirements and the information I receive (good or bad) will be 100% accurate. Your browser is currently in compatibility mode or you need to update your browser to Internet Explorer 9 or later, Firefox or Google Chrome in order to properly view this website.